It’s been quite a week. I’ve been spending the last three nights playing Georg Haas’ Third String Quartet “In Darkness”, which as you might expect, is actually performed in a completely darkened concert venue. In this case the venue was the hemispherical Kendall Planetarium at the Oregon Museum of Science and Industry (OMSI). I was terrified at the prospect of playing this piece when it was first pitched to me by Third Angle artistic director and violinist Ron Blessinger. I’m not a musician who is suited to memorizing material, and given that this piece was to be played in complete darkness, memorization was a given. But I overcame my initial resistance and took the plunge. I am so glad that I did. Playing this piece has been one of the musical highlights of my career thus far. The opening of my sense of hearing just by virtue of the lack of visual cues, and the need to discern harmonies and find my place in them without having the voicing worked out beforehand, was exhilarating. Embracing the improvised aspects of the piece, and savoring the extraordinary receptiveness of our audiences, was incredibly rewarding. It was in many ways all that I hoped that a musical experience could be, and by and large, our audiences and critics agreed. Here are the five (!) reviews of the run that we’ve received so far – and if you ever get a chance to hear this piece within a three hour drive of where you live: take it. You won’t regret the experience. The Boston Cello Quartet, comprised of four young cellists from the Boston Symphony, will release its debut disc on February 5th. 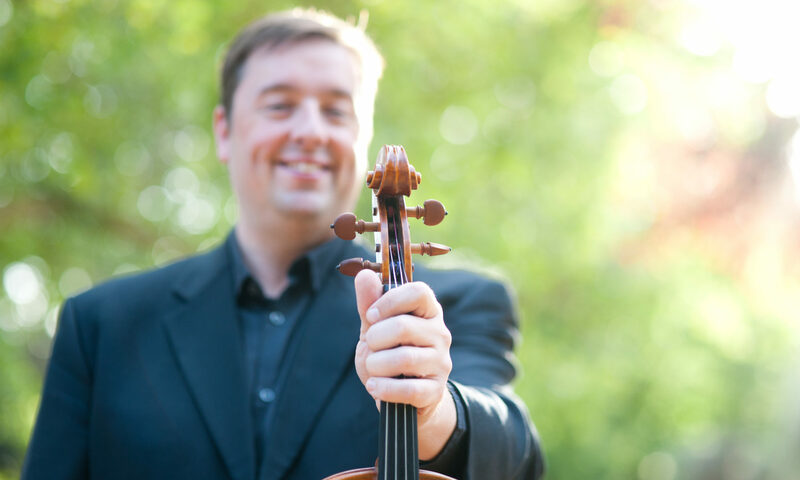 The BSQ was founded in 2010 by Blaise Déjardin, Adam Esbensen (formerly of the Oregon Symphony, and a Corvallis native), Mihail Jojatu and Alexandre Lecarme. They rotate lead players for each piece they perform, and each player is brilliantly suited to the task at hand, showing the virtuosity and flexibility of the quartet, both collectively and individually. The album’s title is ‘Pictures’, and this is undoubtedly due to the fact that the centerpiece of the disc is a virtuoso arrangement of selected movements from Mussorgsky’s Pictures at an Exhibition. The arrangement, by Blaise Déjardin, is quite breathtaking in its simplicity and ingenuity. Listening to each of the movements, I found myself quite forgetting Ravel’s virtuoso orchestration, and simply enjoying the tonal possibilities of the four cellos, and the beautiful playing throughout. There is a wide selection of material for just about any mood on this disc – from the Overture to The Marriage of Figaro, to Debussy’s Clair de Lune, to Piazzolla’s La Muerte del Angel. And the piece de resistance may be the final encore selection by Déjardin, his Mozart Variations, which has the temerity to combine Mahler, Mozart, John Williams, Rossini, McCartney, and Haydn into a delightful bon bon. The sonics of the disc are as superb as the playing. I recommend this disc most highly! It drops February 5, 2013 and is available through iTunes, CDBaby, and Amazon.com.